For those of you who have been with me for the long run, or who may know me face-to-face as we like to call it these days, you are most probably aware that I don’t really like to fly. And that’s putting it mildly. It’s not that I don’t fly. For awhile there I was flying about once or twice a month, most often with the aid of my “mother’s little helper” (for those who don’t know) which, coincidentally, I typically got from my Mother. When I decided I could take on the task “cold turkey” I spent a lot of hours telling the person who was unfortunate enough to have randomly selected a seat beside me, that I used to take drugs to fly but now I get through the ordeal by talking incessantly to whoever it is that was unfortunate enough to have randomly selected the seat beside me. Realizing that wasn’t my best moment, of late I have resorted to minding my own business and plugging into a RomCom that I have hopefully seen less than four times in the recent past. It helps, but I readily admit that I still have a rather fragile relationship with the concept of flight. So it might not surprise you that the recent air tragedies have made me more than a little jittery about getting back on that horse even though I suspect the WestJet flight attendants have dropped the “let’s get this Boeing going” quip from their “welcome aboard”. The problem is I still, at times, have to travel, which means I have been giving some very considered thought to what could be reasonable alternatives to get me to where I need to be. Which, might I add, can be just a little challenging and involve one or more modes of transportation given that I now live on an Island. My first thought, as I suspect would be the case for any true blue Canadian, was to get on a train. To be honest, if I had a bucket list (which I don’t) this might be one of the things on it. Crossing Canada on a train. Of course I first have to get on a boat, and then a bus followed by a subway to the station but, while perhaps a little cumbersome, still seems quite doable. Provided I can pare down my wardrobe to fit into one carry-on as the prospect of schlepping a full size suitcase up, down and over whatever obstacles I might encounter is not, at my age, exactly enticing. But I’ve heard the scenery is spectacular, at least until you hit the prairies. Then it’s not. Never mind. The food’s good, I can watch Schitts Creek and if I play my cards right I can snag a cabin for one. All this for just north of 3500 dollars. Yeah it’s a tad pricey but it only takes four days to get from here to where I need to be. Wait. Let me say that one more time. Four days. Four very, very long days. Watching Schitt’s Creek. Ok, I’m not going to do that and I’m certainly not going to take a bus (I didn’t even have to research that one) so where does that leave me? You guessed it. Road trip! Although I have to be honest that I’m a little hesitant from the get go about this one too. For some people a road trip is everything they have always dreamed about. You know how it goes ‘cause you’ve seen it on the TV. The happy couple loads up the bright, shiny, new SUV, buckles the kids into the backseat, loaded iPads in hand, and sets off on the adventure of a lifetime, with smiles the likes of which rival those in the whitest of white toothpaste commercials. They travel along the ocean byways, sun shining brightly in the deep blue sky with nary another car to be seen for miles. Along the way they stop at all of the interesting and fun “off the beaten track” places, become immersed in the local customs and cultures, meet the most engaging people, and always manage to find a quaint B&B that serves mouthwatering meals in a dining room with unobstructed views of the sun setting over the ocean. You can almost hear the waves and feel the breezes as you watch this spectacle from the comfort of your Lazy Boy. Makes you want to run upstairs, pack a bag, grab the family and get your own show on the road. Except we all know that’s not how it really goes. Especially for a shallow gal like me. You see, for a shallow person a road trip, as are most things in life, is not about the journey. It’s about the destination. When I get into a car I want to get where I’m going and I want to get there fast. Mostly because a “real” road trip almost always includes wicked weather, long waits in world class traffic jams (have you ever driven through LA or TO ? ), enough fast food to have a significant impact on your cholesterol count, and a series of hotels that remind me to heed my Dad’s bedtime advice to “sleep tight and not let the bedbugs bite”. Sure there are viewpoints and little out of the way artisans to visit but that would mean stopping and the last thing I want to do when I get in a car is stop. I won’t even talk about the restrooms one encounters along the way even though at this stage of the game those are the stops there’s no getting around. And now with all the texting and talking and general inattention paid by your fellow commuters there’s no guarantees. Not that there ever were. It’s just these days I don’t really like the odds. Road trip? Not if this kid can help it. Oh well. Looks like I’ll be back in those friendly skies sooner than later. Better give my Mother a quick call. I’m thinking she might have a little something to help me out. People say that you should write about what you know and obvs I’ve been doing that for the past five years. But just so you don’t think I’m some kind of one trick pony, today I’ve decided to write about something else I know. Gardening. Only because that’s what I have been doing lately. And what I know about gardening is, I don’t like it. Not even one little bit. Which might not be a problem where you come from. I get that. For 38 years I lived where the weather alone legitimized my dislike for the garden. I mean why spend countless hours and exorbitant amounts of money on plants that, in a good year, might actually blossom before the first snow? Who needs a tomato plant that yields, if you’re lucky, a whopping three tiny little fruits which, if you bother to take the time to calculate, end up costing in the vicinity of $40.00 a pound (that’s .453 kg for those of you who don’t know). At my old abode there were no expectations; you either gardened or you didn’t. But my new reality is different. My new found home, I’m afraid, is not garden optional. Which is why you might find me outside doing something I would like to like…but don’t. The thing is, around here you won’t hear a passerby exclaim “Oh, what pretty flowers you have!”. No. Around here what you’re most likely to hear from the lovely couple with the matching Tilley hats (I can say that, I have one) is, “Oh, what lovely antirrhinum majus. If I were you dear, I would surround them with some hemerocallis just to bring out the colour” to which the only reasonable response is “thank you. Perhaps next year.” Because as you might have guessed, I don’t know one flower from the next, even when they go by their “real” names. This becomes painfully clear if you were ever to accompany me on my once a year trip to the local nursery where you are apt to hear me exclaim, “Oh look! Pretty blue ones. Let’s get those”. To which my husband, being the more practical one in this partnership, will invariably start asking some silly questions about sun or shade, height and width, wet or dry. That’s easy! “Who cares! They’re flowers. They’ll grow”. Although to tell you the truth, sometimes they don’t. So you see what I mean. It’s not that I don’t want to like gardening. Sometimes I dream about living out in the country on an acreage where I can stroll through fields of wildflowers nestled beside rows of carefully cultivated, meticulously trimmed roses and tulips and chrysanthemums and other things that look pretty. I can imagine myself becoming self-sufficient as I literally reap the fruits of my labour, bringing in baskets of pears and apples that can be made into wonderful home-baked pies and served to top off a dinner filled with only the freshest of vegetables picked moments before being set down on the table. Perhaps a goat or two whose milk will be crafted into an exoctic variety of feta cheese and added to the fresh from the garden salad, a staple at each and every evening meal. At which point this dream of mine takes a quick left as I get rudely awakened by the two rather miserable, and I must say very itchy, bites that have put me in this ™Benadryl stupor for the past two days, reminding me of just one of the many reasons that I don’t like gardening. Even though I really would like to. When I think more about this I realize that it’s not just gardening that I want to like but don’t. There are other things too. Like flying. I mean who doesn’t want to like soaring through the air to some fascinating destination in this wonderful and wide world of ours? I sure do. But I don’t. Put me in the belly of that flying machine and watch me turn into one big bundle of nerves as I consider everything, and I mean everything, no matter how improbable, that could go wrong during the time I am trapped in that cylindrical metal tube which, for some reason beyond my comprehension, can stay suspended 40,000 feet above the earth for extended periods of time. I want to like it but I just don’t. I’d also love to like living in an historical heritage house with a big comfy porch. One where you open the heavy, wooden door to reveal a stately, hand-carved staircase; where the walls hold the secrets of another time. Who wouldn’t want to curl up with a good book on the cozy window seat, close enough to the wood burning fireplace that you can hear the gentle crackle of the flames? Yeah, I want to like it, but I don’t. Mostly because I lived in an old house and know all about broken furnaces, leaky pipes and the everyday occurrences that invariably cost you almost the exact amount of money you were saving to take that flight to some fascinating destination in this world of ours. While I’m still here there’s something else I suppose I have to admit. I’d like to like writing this blog all of the time, but sometimes I don’t. Which I suppose is ok. Because one thing I can tell you for sure. I always like writing the blog better than I like gardening. I know! It’s been quite a while, hasn’t it? The thing is, I’ve been a little busy lately. As a matter of fact, right now I’m writing to you from just about 38,000 feet, listening to my fave chanteuse, Ms. Brandi Carlile, on my way to yet another conference. Which, if I do say so myself is quite an accomplishment since, not so long ago the only way I would get on one of these things was with the help of my “little white pill” and you certainly wouldn’t want to be reading anything I wrote in that state, even if I would have been able to write. I’ve come a long way in more ways than you can imagine. Because, if you have been reading this blog carefully you’ll know that around this time last year both me and the President of the United States of America had quite a lot to celebrate. One year ago, give or take a few weeks, Mr. Obama was reelected and I made my way into yet another decade (you don’t really expect me to tell you which one, do you). And, if I can speak for the both of us, the year has had its ups and downs, perhaps less for me than for him. After all, most of the web stuff I’ve developed over the past year has actually worked. But that doesn’t mean it’s been smooth sailing. Don’t get me wrong. It’s not that I have a problem with getting older. Quite to the contrary, I actually think it’s a “good thing” given the alternative. As a matter of fact, I’ve managed to save quite a lot of money this year by taking advantage of all the discounts that have very recently been made available to me. Let’s face it, I’ve always enjoyed a good hotel but now I get to enjoy it 10 to 15% more, most of the time. And shopping has become a bit of a treasure hunt, what with all of the potential savings to be had on Tuesdays, my new favourite day. If only the sales clerks could remember to always ask me for my identification. It’s a funny thing the cycles of life. For years I hoped no one would make me take my pic out of my wallet to prove I had reached that all-important age of majority because really, how much more mature was I going to be once I did reach 18? But now I’m quite distressed when they take my word for it that I actually meet the requirements for their “special” prices. Which brings me to the one thorn in my side, fly in the ointment, wrinkle in an otherwise well thought out plan. You’ve heard it before. The boomer generation has redefined aging. Well why not? We’re a big group of people and that’s what big groups of people do. So it shouldn’t surprise anyone that we’ve managed to convince the rest of you that “60 is the new 40” whatever that might mean because I’m afraid most of us can barely remember 40. Nonetheless, I’m going to come right out and say that I’ve done a pretty good job of staying fit, at least enough that I can still do 5 long ones on the treadmill without causing any serious damage. And when people who haven’t seen me for quite some time proclaim, “you haven’t changed a bit” I try my best to believe them. Which is why I found my recent experience on the Tube (you recall it was not all that long ago I was wandering the streets of London) just a tad concerning. 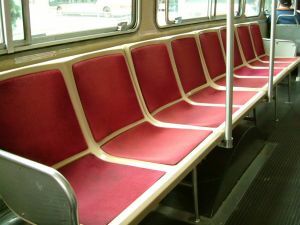 As a Mother of two fine young men, I know it was incumbent upon me to ensure that my sons were aware that, finding themselves seated on any type of public transportation meant they needed, at all times, to be prepared to relinquish their seats to someone older and perhaps wiser than them. It’s the right thing to do. Period. Well other Moms, you and I may have made a mistake. You see, on my most recent travels, almost without fail, as I stood comfortably and securely holding on to the poles provided for just that purpose, some young man would politely tap me on the shoulder and say “Ma’am, please take my seat”. And while I knew his Mother would be proud I, on the other hand, was just a tad mortified. Because up until that very point in time I was happy in my illusion, content to think that I really “hadn’t changed a bit”. But that one act, that innocent and generous gesture, that simplest of requests, that one thing, in and of itself, burst my bubble and made me realize that no matter how much I want to believe otherwise, to those who don’t know me, I have changed, likely quite a lot. And in that moment, my otherwise smooth ride became just a little bumpy. So Mr. Obama, it looks like we made it through year one and as you begin the second year of your term I wish you all the best. As we both continue on our journeys, here’s hoping the ride will be a smooth one from here on out. Although, if you don’t mind me saying, I’d like to think that my term will last a whole lot longer than yours. Before I leave, a quick thanks to my little bro’ for the idea for the post. It helped unblock the writer in me and now you can blame him for this one. More and more I find myself having to defend my status as a shallow person. There are those who perceive my introspection as being incongruent with what I profess to be my true nature. I have gone to great lengths to counter these accusations, providing clear definitions and understandings of life as a shallow person and even subjecting myself to a rigorous grading process which I am pleased to say I passed most handily. And I think if someone were to have a reread of this blog to date there would be little doubt that I have made my case. As a matter of fact, when Kev and I first shared our plan to write the shallow blog with a close friend, his immediate response was “I can’t think of two better people for the job!” and we took that as a compliment. But now it would appear that doubt runs deeper than even I had imagined and at this point I am at my wit’s end as to what to do about it. This new obstacle was brought to my attention on my recent return flight from New Orleans where I found myself buckling into a seat beside two very nice ladies, one perhaps much younger than the other, both likely much younger than me. As I am want to do, I struck up a conversation with my closest neighbor and as conversations go, this one was both congenial and illuminating. I discovered that my new friend (I like to call her that) was a scrapbook consultant returning home from a scrapbook convention where she learned about all of the new and upcoming trends of her craft. Now I can’t say that I have a a great deal of experience in her world but I have never been averse to learning new things, so I listened. She explained to me all of the “ins and outs” of scrapbooking and I asked what I thought to be reasonable and engaging questions. As she told me how she masterfully arranges all of the photos and artifacts in her home I thought better than to mention that when my children were in their elementary years I had politely requested they refrain from bringing home their “artwork” as I had no where to put it, not to mention that I have a particular disdain for fridge magnets. And all went well, or so I thought, until she pulled out a stack of magazines and offered the younger woman in the window seat her choice from the pile. 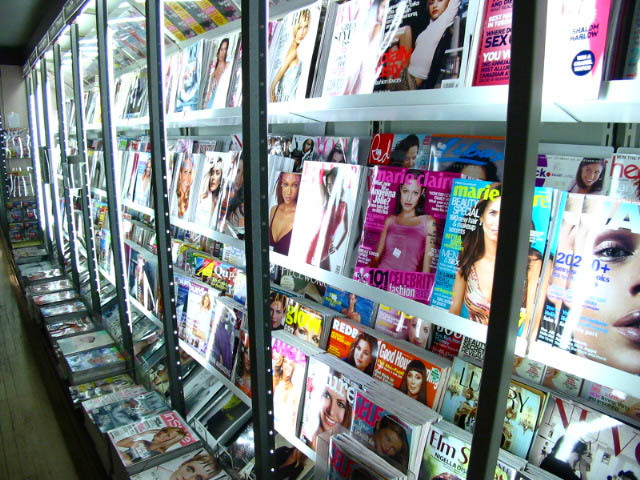 As I sat quietly anticipating my turn to have a look at what was left, she turned to me and said, in the nicest sort of way, “you don’t seem the type to read trashy magazines” and then proceeded to put them back into her bag. So there I was, left straining to read the headlines on US magazine before Ms “Generation Y” turned each of the pages. That’s when I knew I had a problem. What was it I wondered, that made my scrapbooking friend think I was somehow above reading all the latest dirt from tinsel town? Me who has every episode of Glee on my iPad just in case there are no “romcoms” playing on the inflight entertainment system. Me, who can rhyme off the names of the most recent bachelors and bachelorettes along with their chosen mates. Me who takes solace in knowing there are people who need to lose more weight than I do and are willing to go on TV to prove it. Does she not realize that I am the one who writes a blog about being and becoming shallow? How could she be so wrong? How could I look so wrong? So now it’s time for me to take stock. Is there something about my round, tortoise shell glasses which, although quite fashionable, transform me into a rather bookish looking gal? I can take those off. Are my lucky jeans that I always wear on the plane but never anywhere else, causing me to appear a tad out of date? If they are I can make a different pair of jeans lucky. Or do people mistake the rainbow Star of David pin I wear on my jean jacket as support for some sort of obscure cause? Honestly, it was a gift. I don’t even know what it means! Whatever it is something has got to change, and quickly. I’m looking for your ideas and suggestions because if I don’t figure this thing out soon I’m afraid I’m never going to find out which stars were caught walking on Rodeo Drive without their makeup on. I travel a fair bit for both business and pleasure but as much as I like the “being there” I’m not quite as crazy about the “getting there”. There’s just something about being locked up for hours in a very large metal tube that is wholly dependent upon a multitude of computerized parts that I find disconcerting. It’s not that I really think space junk will fall from the heavens and hit us smack on the nose, it’s just that if it does it has occurred to me that I don’t know how to fly. And at 37,000 feet off the ground that’s not, as Martha likes to say, “a good thing”. Nonetheless, for much of my adult life I have ignored these rather inconvenient thoughts, pulled on my lucky jeans, said a few prayers and made my way to the airport. Oh yeah, and popped a little white pill. Pharmacist: So have you ever taken this medication before? Pharmacist: Are you certain you need to take this? Me: I’m only taking it to get on an airplane. Pharmacist: Oh! That’s different! We all take it to get on an airplane. Have a good trip. I’m not sure that made me feel a whole lot better but I took some solace in knowing I was not alone in my plight. And since that day, although things usually go well in the air, they sometimes fall apart at the far side as, depending on the length of the trip there are times when I am not quite my rational self when we land. And that’s when the problems start. Like the time I had to pick up a rental car in Vancouver and when told I had been allocated an Impala, which in retrospect I know to be a fine car, I leaned over the counter, looked the poor unsuspecting clerk in the eye and without even the hint of a smile said “nice try my man, but I like small foreign cars”. Or while unexpectedly grounded in Denver with nothing much to do but shop, I came to the rather expensive, as it turns out, conclusion that my next cup of coffee would taste much better in a $20.00 Ferrari mug and the cat would look smashing in a Harley-Davidson vest. So a few months ago I made the rather courageous decision to fly “au naturel” without the assistance of any synthetic aides. Surely I thought, there are skills I have honed as a shallow person that could help me deal with this situation. And that’s when it came to me. Maybe this is the time to exploit my propensity for small talk, my uncanny ability to carry on a conversation about essentially everything and nothing because honestly, that’s what shallow people do most of the time. Want to talk about your kids? I’ve got some too. Interested in politics? How about that Obama! Going to university? I work at one. Don’t like flying? Boy, do I know how you feel! And so it was that on my first foray into substance-free travel I was fortunate enough to sit beside a woman who not only had children attending university out of town (mine too, and can that ever get expensive!) in Ontario (hey, I used to live there) but was also employed by the same institution as I am (let’s see, who do you know?). And it worked. Four hours later as we touched down at our destination I realized that not once had I thought about the possibility that a bolt could come loose on the left wing causing it to fall off in mid-air. Of course there is no way of knowing who you’re going to get so you have to be flexible and roll with the punches. And since you may have to be the one that initiates the conversation take my advice and have a quick peek at Yahoo News just before you board. Yes I know some people use their travel time to do a little work, lose themselves in a good book or just catch up on some well-deserved sleep. But the next time you find yourself sitting in the seat next to a “Chatty Cathy”, be kind. Because although they may not be as interested in you as they appear to be, you just might be their “little white pill”.